June marks 40 years since the launch of the 8086 and while not the earliest example of a microprocessor, it’s certainly one with a significant impact on the history of computing through introducing the x86 architecture. While that innovation continues to influence nearly all aspects of modern life, early tech companies themselves looked to other industries when it came to business models and the solution architectures to support them. The technology industry has swung between centralised and centralised computing architectures for the last three decades, primarily driven by the capability of computing devices and economies of scale. From an operating perspective, technology businesses have been inspired by the electricity industry who had established the utility concept following the “War of Currents” in the mid-1880’s. Before that, electricity was produced in a multitude of different ways and consumed at the source. 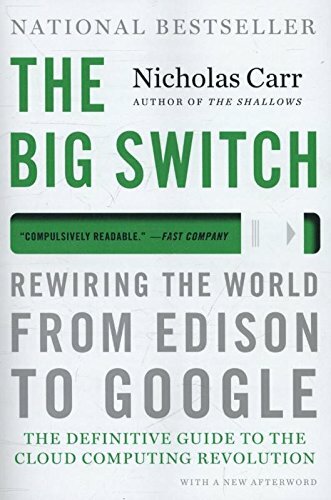 After the dot-com dust had settled, the opportunity became possible to leverage the continuing increase in computing power and, as the electricity industry had benefited, improvements in the distribution of those resources (networks). What did the technology industry like about the utility sectors? Probably a lot of things such as recurring regular revenue streams and consistent incremental increases in charging models although, in the technology sector, that has in past been kept in check by continuing improvements in computational power and competition. That competition has consolidated with AWS, Azure, Google forming the Gartner Cloud IaaS Magic Quadrant in 2018 followed by Oracle, Alibaba and IBM, so whether that price competition continues will be something to watch. Electricity is unconnected from its intended use (neither the power nor the supplier care whether it’s a fridge or a Selfie Toaster) delivered over a standard infrastructure. Embedded in the capital costs and maintenance is the offer price. The exchange is simple: supply via infrastructure, invoice and payment on separate channels. Amazon’s first foray into this world was way back in 2002, only two years after riding out the dot-com bubble burst although it didn’t take on it’s more recognisable shape as AWS until 2006. The public cloud computing services market is forecasted to hit USD 302Bn by 2011, instigated by the utility model. The utility-computing model includes the mobile/edge computing revolution as a massive consumer of the utility-computing services. Utility computing has, in turn, created demand for more energy generation. More efficiency and driven by environmental necessity and public pressure have derived cleaner methods of generating that energy at both a micro and macro scale. So, what does it mean when technology disrupts the business model that inspired it in the first place? The irony here is, those same properties of sustainable and incremental income embraced by the technology sector and consumer alike are the very properties that are causing a backlash against electricity providers. With over a century of utility-based electricity production, the generation that embraced the transition from kerosene, whale oil and a multitude of companies providing electricity with a variety of standards is not the present generation. Today's families complain at the ever-increasing costs of electricity supply (notwithstanding world population increasing from 1.65 Bn in 1900 to 7.4 Bn in 2015 requiring investments in infrastructure and efficiency solutions). Likewise, electricity doesn’t have the benefit of product differentiation like data-driven technology products do. It looks, smells and tastes the same, irrespective of provider. Although if you use the last sense, this article is probably not for you! The renewable energy market continually introduces new options for electricity generation to households and businesses including photovoltaics, microturbines, electric cars, and smart homes. Legislation and regulation are at different stages globally. For example, the deregulated electrical retail and supply market in NZ is very favourable to new entrants and alternative supply models. Although facing increasing competition in the retail electricity space, New Zealand’s major electricity retailers over the last few years, have reduced the c/kWh for buy-back (when installing a grid-tie as part of a self-generation deployment). The buy-back which began with matching the retail rates retrenched to one much lower ~7-8c/kWh or about a quarter of the average retail prices in New Zealand. This pricing has acted as a disincentive for consumers of electricity to invest in PV, especially when factoring in NZ sunlight hours when compared to the Middle East. Recent projects in Saudi Arabia are achieving just over 2c/kWh although those prices are obtained using a traditional centralised generation model. Canterbury University’s Electric Power Engineering Centre produced a paper in 2015 calculating the Net Present Value (NPV) for around 2000 mixed usage homes in Christchurch. A key finding was households that gained the most from PV systems were generally high-energy users who consumed a lot of power during the day. Specifically, avoiding relatively expensive energy storage set-up costs and minimising the impact of low buy-back rates. The data centres that drive the cloud are themselves, an excellent example of consuming energy at point and time of generation. Companies such as Google, Microsoft all have precedents of co-locating their data at hydro-dam locations which have the added benefit of providing additional cooling capacity. Heat storage – Although not everyone would have a big pool with which to warm and luxuriate in, other options include hot silicon storage, molten salt or high-density ceramic bricks. Heat exchange control systems with a thermal bank can provide the heating or cooling needs for a home. Thermal energy storage, however, is one of the more controversial areas of alternative energy generation with most of the industry focused on further improving battery storage technologies. Protein creation – Create food onsite with small-scale vertical farms. While you wouldn’t gain maximum efficiency because of low overnight power, an enclosed environment with the right nutrients and the perfect wavelength light for green plants. This company is even experimenting with peaches! Generate cryptocurrency – With Bitcoin mining now consuming more electricity than Ireland and on track to surpass Austria by the end of 2018 why not generate a little coin on the side? Chinese miners have built the cryptocurrency mining capacity inside the dam infrastructure. If we can reduce our non-generation time energy consumption to things such as televisions, lights, computers etc. then our electricity storage needs can be reduced. You could modify fridges and freezers for heat exchange usage, but I suspect the economic inertia would probably keep it reasonably cost prohibitive for the foreseeable future. What key distributed energy technologies can disrupt the power sector? What impact could these new business models have on incumbent utilities, and what opportunities may exist for other industry sectors to capitalize on these changes? New Zealand, for example, can add sufficient clean generation capacity and still provide enough electricity to convert New Zealand’s vehicle fleet from hydrocarbons to electrical. However, that still requires significant capital investment, and even with clean-energy generation, impacts on the landscape that come under political and public pressure. Drift in the U.S. offers a way to connect localised generators of electricity with consumers together, using a peer-to-peer model rather than centralised control. Again, this reflects the innovation-driven from the technology sector establishing direct deals with dams and other clean energy generators. Electricity is entering its 1st distributed vs centralised battle in over 100 years because people want something cleaner and cheaper. The technology industry that used the utility model to grow into global companies has provided the platforms and the speed of innovation that is turning the utility model for traditional sectors on its head. Alternatively, if the electric utilities can survive long enough, they can wait for the next centralisation cycle and beam the power from space!